If you’ve been a Telstra customer, you may be used to a free treat like cheaper movie tickets. Good news: that’s not changing, but now you might eventually get other bonuses, it’ll just take a really long time. Shoppers in Australia are probably members of at least one rewards system, whether it’s for a supermarket, a credit card, or an airline, and possibly all of them. They’re systems that can change the way you shop and the way you spend, but for many of us, they’re just points that rack up in the background and do a lot of nothing. And that’s an area Telstra appears to want in on. This week, one of Australia’s major telcos has signalled that it too will be getting in the rewards program, adding a rewards counterpart to customer accounts dependent on how much they spend, and initially how long they’ve been a member of Telstra for. Called Telstra Plus, it’s basically an evolution of the “Telstra Thanks” rewards program that offers discounts on entertainment sources like movies, sports, and music, and while all of that will stay for every Telstra customer, the changes will be cumulative in the background. Specifically, you’ll gain points. Like other systems, those points won’t reflect real dollars or cents, sitting at a portion — a very small portion — of real world value, with the end result possibly gaining you a bonus, like a speaker or some other gadget, or even a discount on a new phone. In the real world, this costs extra, but provided you wait long enough, these might eventuate into a product you’ve probably stopped caring about, arriving like a random surprise delivered in Telstra’s equivalent of a nondescript box. That may take some time, mind you, with Telstra advising that a household spending $80 per month would need to wait 18 months to get a smart speaker (it didn’t say which one), $160 per month for 18 months to get a Telstra WiFi Booster, while a household would need to spend $255 per month and had also earned bonus points by adding a new server would after two years have enough to get 25 percent off a Galaxy S10. Given the Galaxy S10 is $1349 for the 128GB model, 25 percent is $337.25, telling you that after two years, you’d only be saving a little over $300, and that’s over a phone that won’t be flagship in the next two years. We’re not sure if that necessarily makes the Telstra Plus program value, though at least it has something in common with most other rewards services, because you’ll probably be racking up points for something you might never use. 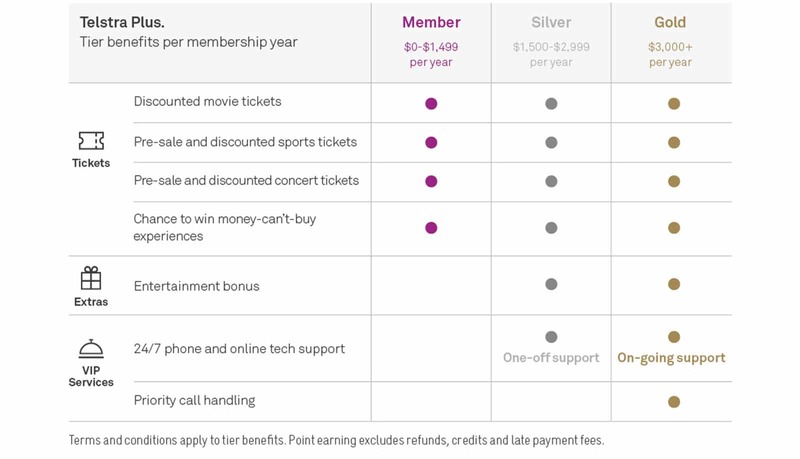 Telstra does say that you’ll get a tier status based on how much you spend, and while all Telstra customers are Telstra members with cheaper movie tickets, “silver” members get a “one-off Telstra Platinum tech suppler call online or over the phone” each year plus an entertainment bonus the company hasn’t announced, while people who spend even more will be on “gold” and will get “priority call handling and 24×7 tech support”, which makes you really wonder where in the line everyone else sits. Officially, Telstra says you get 10 points for every dollar you spend, with customers who sign up before June 30 getting 1000 extra points, and those who have been with Telstra for several years getting 10,000 points. Again, what those points will get you is anyone’s guess, though you will be waiting a while, with what seems to be a minimum of 60,000 points needed for a little over $300 bucks off a new phone. Unfortunately, the points seem to be only useful for Telstra’s bonuses, with no way to transfer them to another system, as Telstra confirmed to Pickr that these rewards cannot be linked to a Frequent Flyer account. Sad face. Whether a Telstra customer will see any real use out of the program, that’s anyone’s guess, but if it racks up points in the background with the hope that it delivers you something in the end, it’s just one more that does it. And as to whether it matters, that will depend on the customer. We’re not sure we’d find use in a one-off tech support call and doubt spending more would incentivise us to get better support, but if that’s you, at least you know how to get better support and possibly a phone discount out of one of Australia’s biggest telcos.